Keith McNally protégé Dean Jankelowitz (Schiller's, Pastis, Balthazar) is behind this morning-to-evening café. The 40-seat restaurant—sporting dark-green leather banquettes, brass railings and marble counters—serves homey fare, like Jankelowitz's grandmother's matzo ball soup made with duck fat, a skirt steak sandwich served alongside hand-cut fries, and piri-piri-hot-sauce-marinated chicken kebabs. 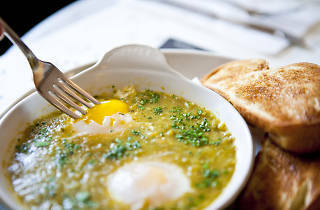 In the morning, find Stumptown coffee, homemade croissants and full breakfast plates, including soft-boiled eggs with challah "soldiers" (strips). While this place always has a crazy line and beautiful people, you'd think it would be so expensive and over-priced but the food is great and all reasonably priced. Try it for dinner for a less-chaotic experience! Jack's Wife Frieda is a wonderful brunch spot for Mediterranean food. Must try dishes are the Green Shashuka and Rosewater Waffle which are two showcases of what this place does best with the fresh ingredients. It's affordable and should cater to all types of diets. However, the space is small so groups larger than four might have a harder time getting seats though that shouldn't deter you from trying them out as they have two locations in walking distance of each other. It gets really busy during the weekend (like any other brunch spot) but brunch is served all day and even on weekdays if you're feeling like having a nice breakfast before heading to work. It's a light, bright space and the staff are always attentive and friendly. 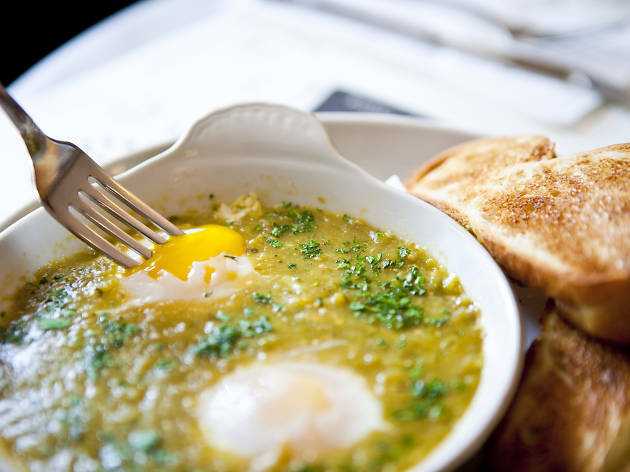 Brunch is a must at Jack's Wife Freda! Be prepared to wait awhile for a table! The restaurant is small and has many diners waiting to be seated. The avocado toast and the shashuka are my favorites for brunch! The wait is well worth it for the meal! I absolutely love this place. the food is delicious, I especially love to brunch here. This is a must-visit spot every time we come to NYC. The food is always on point and the Hot Toddy is one of a kind. Went here for the first time with a friend for dinner and loved it! We went at around 6pm, the place was busy but not overly packed. It's a cozy little spot with a fun and affordable menu. I got the burger while my friend ordered the lasagna, both dishes were delicious. Any place I can get a cup of matzo ball soup for brunch is a-okay with me. And this is one of the best cups I've had in New York, which is really saying something! The ambiance here is lovely, the staff is friendly and the food is delicious. A plus stuff! Recently went to NY and had dinner here as I've heard only good things and it definitely lived up to my expectations. The one item on the menu I highly recommend is the roasted chickpea dish. Absolutely delicious! Next time I'm in NY I want to go and try out their brunch menu. Even the simplest ingredients here taste out of this world, like a greek yogurt topped with incredibly fresh slices of grapefruit and a sprinkling of sugar. I really love their shakshuka, along with their extensive selection of tea. Lines can be long but if you stop by early enough on a weekday, the tables turn pretty quickly. Went to this place with my wife for my birthday brunch a few weeks ago. The place was packed but the tables seemed to turn pretty quickly. The waitstaff was friendly and kept checking on us while we were waiting which I appreciated. Once we were sat I had to decide between the Shakshuka or the Madame Freda sandwich. I decided to go with Madame Freda which was a delicous egg sandwich with duck pastrami, egg and gruyere cheese. It was fantastic - I never had duck pastrami before and it was lean and very tasty. I liked it so much I even ordered a side of duck bacon to go with it! Will be back for the Green Shakshuka! I had high hopes based on the menu being varietal and including a lot of veggies. It turns out that the vegetarian entree was my least favorite. The chicken was perfect with the green cilantro jalapeño sauce. The zucchini and eggplant apps were nice too. The space is very small and always busy but service is great. They also have a second location on 50 Carmine Street between Bleecker and Bedford which gets great light. The watermelon juice is delicious and the Chicken Prego sandwich I had was just perfect. Fun atmosphere and very hospitable staff. Definitely a great addition to the West Village neighborhood. Top service, and a great menu. Food was average (I had the greek salad and eggplant lasagne) but the main issue was the acoustics. I couldn't hear a word my boyfriend was saying, but had the conversation of the people beside us blasted into my ear all evening. This place is awesome-it's exactly what you need in the big city, great food, great vibe, warma and inviting. It's like everything I've ever eaten there was prepared especially for me-fresh and just plain good. My new favorite spot-any time of the day. Oh, and the staff and owners are very warm too-but not in an in your face way, cool vibe all around.